Did you know that the bright yellow ball that shines in the sky, which we call the Sun, is also a huge magnet? However, it is huge only in terms of spatial dimensions – the strength of the magnetic field is only about 1 Gauss (G), or 10-4 Tesla (T). This is 10,000 weaker than the strongest magnet you can buy. The strongest magnet ever built on Earth produces a magnetic field of at least 45 T. Meanwhile, there are some other tiny dots in the sky with fields as strong as 108G, or 104T! These tiny dots are white dwarf stars, which are about the size of the Earth, but with a mass comparable to the Sun. They maintain their hydrostatic equilibrium thanks to the Pauli exclusion principle: gravity can not further compress the object without pushing electrons into the same energy states, so the electrons push back, causing what is known as degeneracy pressure. The high field observed in some white dwarf stars is probably related to the fact that they are tiny: their progenitors had much smaller fields, but when they are compressed into a planetary size, the field is strengthened due to the magnetic flux being conserved. However, the process of evolution involves lots of mass being lost, and we don’t know exactly what happens to the magnetic field during these stages. As a result, we cannot fully understand the origin of such high magnetic fields. With the data release 2 of Gaia, which has made many astronomers draw a big circle around April 2018 on their calendars, we should identify hundreds of thousands of new white dwarfs. Something between 5 and 30% of them should be magnetic, based on the fraction of known magnetic white dwarfs. So it’s about time we start learning more about these objects! One particular problem we currently have is that it is very hard to estimate the mass of magnetic white dwarfs. We usually cannot apply spectroscopic analysis, our main method of estimating masses, because the spectral lines of magnetic white dwarfs are affected by the Zeeman effect. This effect causes an extra broadening which we have not (yet) been able to model together with the other important effects. In summary, no complete model exists! Gaia will give us a hand with that by allowing us to estimate the radius of white dwarfs – which is related to their mass (more about it in this bite). But we still have to know the temperature of the white dwarf to be able to do further cool science, such as estimating the age of stellar populations (like here and here). Figure 1: The author’s spectral fit to the hydrogen Balmer lines, from H8 to Hß. The top panel shows the best fit using a convective model, and the bottom panel shows the best radiative model. The obtained values of effective temperature and logarithm of the surface gravity are indicated. Figure 1 in the paper. Now we finally get to today’s paper. The main issue with estimating the temperature of magnetic white dwarfs is that we have theoretical evidence that the magnetic field can suppress convection in the photosphere of magnetic white dwarfs. As the white dwarfs cool down, they reach temperatures where radiation is no longer effective in transporting energy, so convection should kick in. In other words, the photons alone cannot effectively transport energy via radiation, so the matter itself starts moving up and down in convective cells to help with the process. However, the magnetic field can prevent that, as found in magnetohydrodynamics simulations (a big name for simulations of an electrically conducting magnetic fluid). Despite this evidence, the predictions had not been confirmed, until today’s paper. The authors studied four white dwarfs – one magnetic, and three non-magnetic. They chose a magnetic white dwarf with a very weak field, of only tens of kG, so that the lines are not so much affected by the Zeeman effect and spectral analysis can still be used. They then compared the agreement between effective temperatures and surface gravities derived from fits to optical and UV spectra, both with radiative and convective models. Fig. 1 shows their fit to optical spectra with the two models. Although both seem to describe the data very well, only the values obtained with the radiative fit can also describe the UV spectra, shown on Fig. 2. They have also independently fitted the UV and optical spectra and checked the agreement between both temperatures, as shown in Fig. 3. Again only the radiative model leads to agreement between UV and optical spectra for the magnetic star. For the non-magnetic objects, on the other hand, the agreement between both fits is much better with convective models. There’s nonetheless one exception, the white dwarf WD1310+583, for which there was no agreement between the temperatures in both cases. 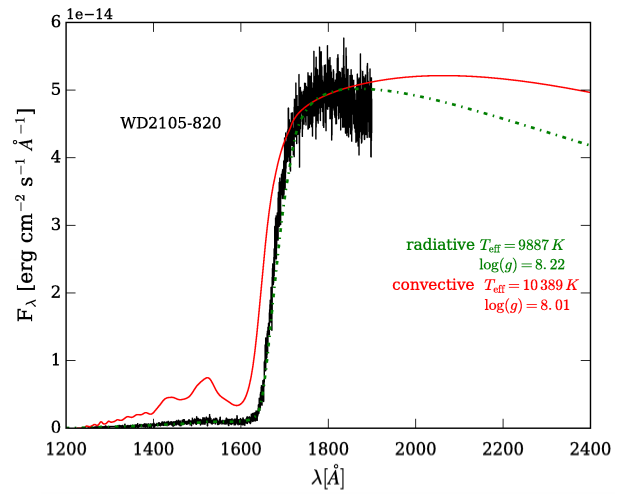 Figure 2: UV spectra of the magnetic white dwarf, with the radiative (dashed green) and convective (solid red) models overplotted. The physical parameters are the ones obtained from the fit to the optical spectra. Adapted from Figure 2 in the paper. Figure 3: Comparison between values of effective temperature obtained from UV and optical spectra. The solid line represents a perfect match, while the dashed lines show a ±350 K uncertainty, typical in the models. WD2105-820 is the magnetic white dwarf. 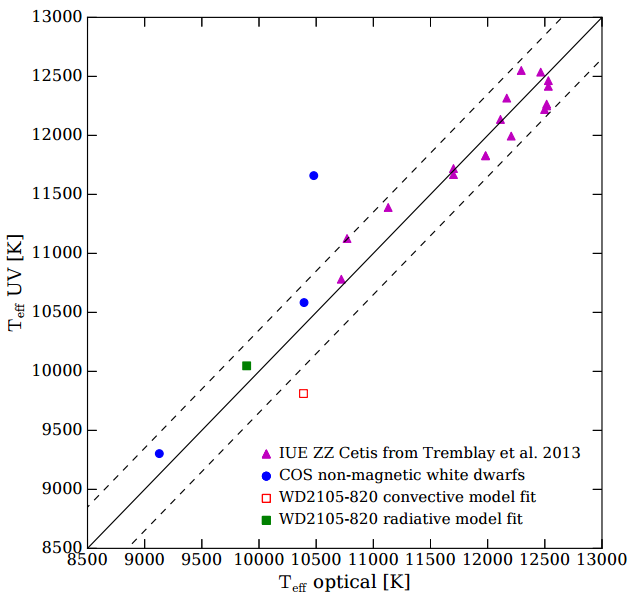 The non-magnetic white dwarfs analysed by the authors with COS spectra are shown as blue dots. Some pulsating white dwarfs (known as ZZ Ceti) previously analysed using IUE spectra are shown as magenta triangles for comparison. Figure 3 in the paper. Bonus: a new double degenerate system? To explain the behaviour of WD1310+583, the authors suggest it is in fact a binary system of two white dwarfs, in which one dominates the UV spectrum, while the other has a significant effect only in the optical. Fitting a combination of two white dwarf models spectra to this object, they find that the primary star would have a temperature placing it in the white dwarf instability strip, where the stars show intrinsic photometric variability. None of the solutions obtained with a single white dwarf suggest that. Happily, the authors could verify with their data that the white dwarf indeed seems to vary in brightness, giving further support to this theory. With a simple test, the authors were able to confirm a theoretical prediction. Theory and observation don’t always walk hand in hand in astronomy, and sometimes one takes tens of years to catch up with the other. (It took us almost a hundred years to directly detect gravitational waves!) It is uplifting to see one example of this happening so quickly! We are on the right path and ready for more data, bring it on, Gaia!